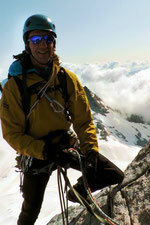 Climbing instructor of the DAV (German Alpine Club, Sektion Neu Ulm) for mountaineering, ice and rock climbing. Experienced mountaineer, no matter if on ski, ice or rock routes with tours all over the Alps, from Mont Blanc (4.808m), Nordend (4.609m) and Nadelhorn (4.327m) to North Faces like Piz Roseg NE-Face, Petersenspitze-Brochkogel and Wildspitze N-Faces, just to name a few tours. Harry lists his favourite rock climbing spots as the Dolomites with Rosengartenspitze (“Steger”), Vajolettowers, Bergell, Tannheimer, Ammergauer and more. 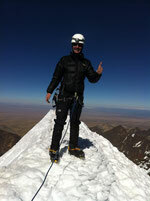 2012: Illimani (6.400m), Condoriri (5.700m), and first ascents of two 5500m peaks, previously considered to be unclimbed. Andes, Bolivia. 2011: Mt Khuiten (4.374m), Altai, Mongolia. 2010: Huayna Potosi (6.088m), Pequenio Alpamayo (5.400m), Andes, Bolivia. 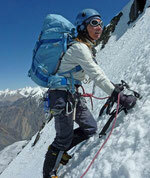 2009: Spantik (7.027m), summit bid failed due to bad snow conditions, Pakistan. 2008: Cerro Plata (6,094m) and other 4-5000m peaks, Argentina. 2007: Khangyatse (6.400m), Stok Kangri (6.153m), Ladakh, India. 2012: Nameless Peak, (5.700m), Ghidims Valley, Shimshal. 2011: Kuksil I (6.152m), Northern Ghujerab, Pakistan. 2010: Stok Kangri (6.153m), Ladakh, India. Birgit turned her passion for filming into profession with a education in video journalism at the Wifi of Vienna. 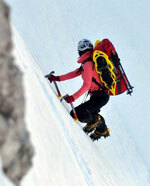 With her skills, she is responsible for the documentary of the exped, supported by Chris. 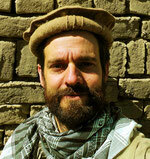 On his 4th Tour in Pakistan, well familiar with Shimshal, the local people and their culture and traditions. Successfully climbed Koh-e Brobar (6.008m/first ascent) with the same team from Shimshal. Further tours: 2012 Afghanistan: Wakhan Korridor, Koh-e Elgha Eli IV (5.725m/first ascent), 2010 Bolivia: Huayna Potosi (6.088m), Licancabur (5.920m), Uturuncu (6.020m – retreated at 5.700m), 2009 Iran, Mt. Damavand (5.671m). Received the “Globetrotter of the Year 2012” award for the Afghanistan Expedition 2012.